Zhu Yuanzhang's parents lived in a tumultuous period of Chinese history. Control and authority in the Yangtze Valley area by the ruling Mongolian Yuan Dynasty (1279-1368) had mostly ceased to exist. Lawlessness reigned and people were left to survive by their own devices. His father was Zhu Shizhen (aka. Zhu Wusi) and his mother was Chen Erniang. They were both uneducated tenant farmers roaming the area of the eastern Yangtze river valley, north of today's Nanjing and in today's Anhui and Jiangsu Provinces. 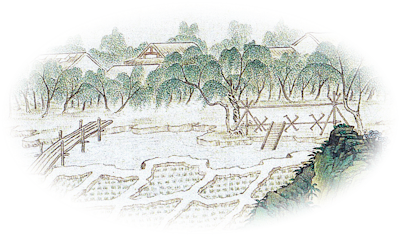 The Zhu's were scraping a livelihood at the mouth of the Huai River a little north of today's city of Xuyi in Jiangsu Province, when Zhu Yuanzhang (birth name Zhu Chongba) was conceived in 1328. 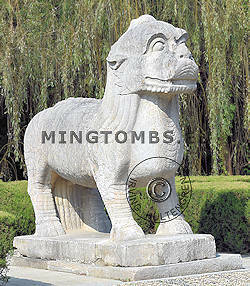 This is likely why he later decided to build a mausoleum, Mingzuling, for his ancestors in this area. Desperately poor his parents had to give away several of their eight children as they were unable to feed them. Being tax dodgers and when conscripted to forced labor in lieu of taxes then the Zhus, with their eighth offspring on the way, saw no other way for survival than moving away. They resettled some 80-100 kilometers further west in the prefecture of Haozhou, today's Fengyang in Anhui Province. The name of Fengyang was actually decreed by Zhu Yuanzhang in connection with the commissioning of Huang Ling. It means "Phoenix Mountain Southern Side"
It was in Haozhou that the Zhu's youngest child, the future founder of the Han Chinese Ming Dynasty (1368-1644), was born on 21 October 1328. With casual labor and local farming the Zhus managed to get by until a multitude of natural disasters, likely including the "Black Death" plague, wiped out Zhu Yuanzhang's family to famine in a space of three weeks of April 1344, when he was just 16 years old. When they passed away his father was 64 years old and his mother 59. Having neither funds nor land he merely wrapped his family members in white cloth and eventually through the grace of the son of their landlord had them interred. Now orphaned, Zhu spent time in a monastery, joined rebel forces against the Yuan Dynastic troops and eventually united all the rebels in his Ming Dynasty, declared in Nanjing 1368. But that is another story. The huge personal shame of not offering his parent a proper burial never left Zhu's mind and one of his first endeavors once the Ming had been established and things had quieted down was to eradicate this shame once and for all. He ordered a mausoleum, Huangling, constructed for his parents in a location a little south of Fengyang, his birth town and where his parents had perished. Huangling is located a little southwest of Zhu Yuanzhang's hometown of today's Fengyang in Anhui Province. While writing this (2018) local efforts are underway to create a more adequate front entrance to the tomb area with information buildings in Chinese style. The layout is relatively simple and all organized in a straight line, almost 800 meters long. Not to be outdone, the length is similar to the more famous Sacred Way of the Ming Tombs, Shisanling, north of Beijing. The tomb is divided into four main sections. 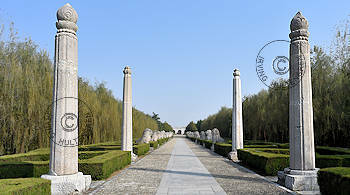 First is a Sacred Road lined by stone figures followed by a memorial section with water flow, bridge and steles. Third is the veneration section with remnants of the Sacrificial Hall or Ling'endian and finally, the altar and tomb (mound). 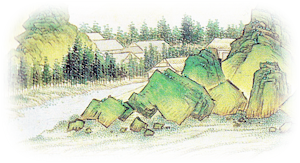 The tomb renders the impression that Zhu sought advice from people knowledged of the earlier "golden" Tang Dynasty and that he applied these ancient conventions in the construction of his parents' tomb. The current entrance to the mausoleum area is a relative simple building with a doorway, which has little to do with the original entrance now long gone. The first area that one enters into has been laid out with nice plantation and doubles up as a souvenir store and public conveniences. After ascending a few steps one leaves today's civilization behind and finds themselves back to the tumultuous times of the mid-14th Century. In front of you is an impressive and awe inspiring 220 meters long pathway lined with no less than 56 stone figures, 28 on each side. The path is so long that one is unable to clearly recognize any figure more than 10-12 ahead. 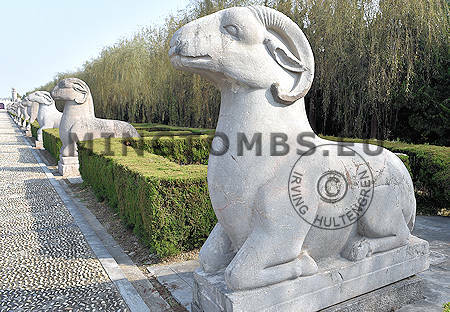 The concept of using stone sculptures in front of a mausoleum goes all the way back to the Qin- (221 BC - 207 BC) and Han Dynasties (206 BC - AD 220). Their purpose is to serve as an honorary guard of the tomb occupant before his or her death and as symbolic guards after the death of the tomb occupant. The figures always come in pairs across from each other. On each side they always come in an even number of the same figure, be that 2, 4 or 8. Some have been restored but many still stand in their original shape untouched. The first two pairs of the Sacred Road are the all important mythical and legendary Xiezhis. Xiezhis are known for their ability to tell right from wrong and to recognize truth from dishonesty. With this ability and being first in line on the road the Xiezhis with their single horn could prevent evil spirits or ill-minded people from entering the tomb. Their presence also reflects on the tomb occupants, who must have demonstrated wise rulings or, in this case, wise parenting while alive. 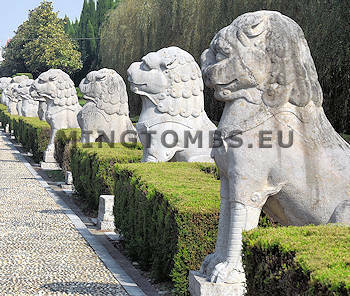 The Xiezhis are followed by no less than 16 stone lions, 8 on each side of the Sacred Road. They are all squatting. The lions are the "King of Beasts" and symbolize supreme power. In ancient times they were reserved for the exclusive use by the emperor. Nowadays, they are often found flanking the front door of private houses. 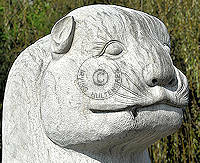 Many of the lions statues have been restored and repaired. They all have finely carved curling hair although to a varying degree. Some even have a smaller snout. Next on the Sacred Road are two sets of stone columns. These more than 7 meters tall pillars are known as "Wang Zhu" and have been used as entrance points for ceremonious areas since the Tang and Song Dynasties (618-1279). 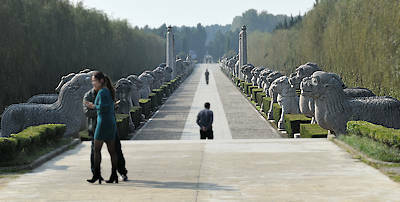 It is a little unusual not to place these sacrificial columns at the start of the 800 meter long path at Huangling. 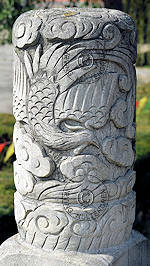 Each pillar is always cut from one single piece of stone, but the engravings differ. On each of the six sides of these particular pillars, engraved petals cover the base and various flowers ascend all the way to the top. As was customary, the top section is shaped like a lotus flower, here carved differently on each pair. The carvings render a strong impression of grace and dignity. The stone pillars are followed by two pairs of officials with a horse. The first pair is holding the reins of the horse, whereas the next pair stands idle next to horse. Even the first pair differ from each other. The right pair shows two relaxed and smiling officials, one of whom holds the reins of the horse close to its chin. The opposing pair however are bearded and carry a far more serious and sinister facial expression. Also the second opposing pairs differ from each other. The bearded and more serious looking horse attendants are placed on the right whereas the more relaxed attendants on the left appear more relaxed. Common for them all is the high level of craftsmanship. The individual strands of hair of the manes are clearly visible and even the breeching of the harness is richly decorated. Horses were particularly important in the 1300s as they by far were the fastest way of communicating. 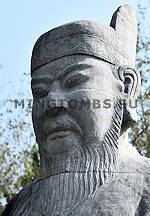 Especially for Zhu Yuanzhang his horseback warriors played a significant role in his battle successes. Now back to the animal world, the path is lined with four pairs of mythical beasts, which I have not been able to identify. The are portrayed with and without humpback. Most have been restored but some clearly show signs of wear and tear of time and the elements. Although their facial expression generally is warm, they all have long, sharp fangs, which indicate a role of guarding and protection. They have soft, flat and large noses with long catlike whiskers. Their ears are depicted as attentive and they have long tails. Next down the path are four pairs of rams with every second pair having a raised head. The rams are lying on all four legs. Hooves, curling horns, ears and faces are crafted to perfection. In contrast to the other figures, the rams appear to be available but resting and not ready for any immediate reaction to an adverse situation. The final twelve stone figures, 6 pairs, consist of officials, generals and, again, officials, in that order. 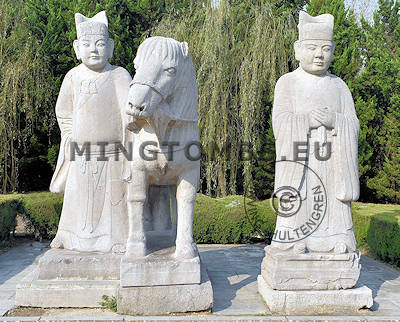 These stone statues are each over 3 meters tall and weigh in well over 7-8 tons. They are originally carved from one piece of stone, although later restorations have necessitated "spare parts" to be added. At first are two pairs of courtiers or noblemen. The first pair of these two is goggle-eyed, well dressed and with folded arms showing respect and awaiting instructions from the tomb occupants. They are bearded and hold documents in their hands. Even up close it is hard to truly see the masterpiece of stone masonry that has gone into these figures. Over time the fine carvings have become difficult to see and only the jade belts, the folds and creases in their cloth and embroidered pearls can be seen. 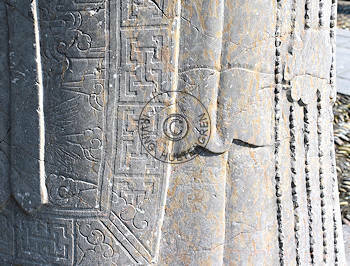 Prompted by the tour guides however, visitors frequently stroke the backside of the robe of the first figure on the right (above) and this gradually brings out the finer decorations. Now one can clearly see flying birds and cloud patterns that were otherwise virtually hidden from view. It bears testimony to the superb skills level that the masons mastered in the late-1300s. Two pairs of military officers follow the courtiers on the path. They are highly imposing, not just by sheer size and mass but equally with the formidable impression of strength and stateliness. They are bearded and carry full armor with breastplate, head gear, boots and leather. They rest their hands on their sword, ready to jump into action and protect the tomb occupant if necessary. In the Ming Tombs north of Beijing the officers have their hands on their breast and not on their sword. The uniform has an abundance of rich decorations in almost all of the parts of the statue from the helmet down to the boots, front and back. The first pair has goatees and knotted robes whereas the second pair has whiskers but no knotted robes. Last on the statue lined Sacred Road are two pairs of eunuchs. They are dressed in simple court clothing and stand humbly at attention ready to obediently carry out any request from the tomb occupants. 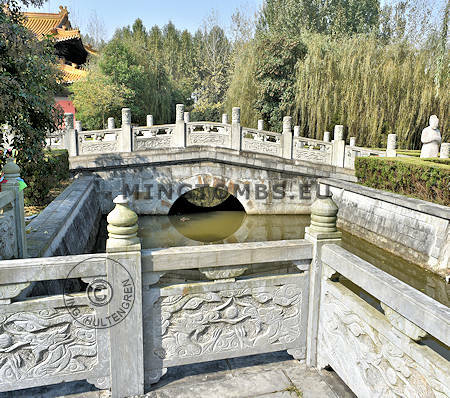 At the end of the line of statues comes lies the bridge that spans the Golden Water River. This water flow gathers the all important "Qi" that ensures vigor and life to the mausoleum. It also acts as a drain to dispose of rain water so as to prevent flooding of the underground tomb and its surface buildings. Viewed from above, the bridge is shaped like a double funnel, opening up at both ends. It has a total of 9 sections between 11 balustrades on each side. The sections are richly decorated with alternatively cloudy patterns or a dragon, the latter normally reserved for the emperor but in this case demonstrating Zhu Yuanzhang's filial respect for his deceased father. Like the dragon symbolizes the Emperor, the phoenix symbolizes the Empress. So where the sections carry the dragon, then some of the balustrade tops depict the phoenix. Figuratively, that would be Zhu's filial respect for his deceased mother. A now dried up fresh water well was placed close to the edge of the Golden Water River. The well has been surrounded by a small platform, which partly reaches over the river offering a good view of the bridge and the river. The sections of the platform depict two dragons playing with a pearl. In the later Ming mausoleums it would normally be a dragon and a phoenix that would be playing with a pearl on the stone slab in the center of the staircases. The balusters of the small platform are topped with a closed lotus flower. In the background left on the image is a small section of the building housing the commemorative stele for Zhu Yuanzhang. The mausoleum has two steles both placed right after the bridge, Huangling Stele to the right of the Sacred Way and the "No-Word" stele left of the road. Both steles are properly housed in imperial style constructions, that is a square building with a double hip and gable roof covered with yellow glazed tiles. The buildings are erected on a small elevated platform to prevent flooding. 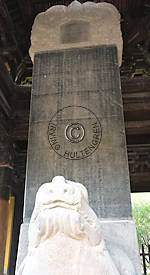 Also common for both steles is that they are erected on a tortoise-like stone animal. The Huangling Stele on the right (or eastern) side of the road is almost 7 meters high and carries an inscription of 1,105 characters, authored by Zhu Yuanzhang himself. To please the emperor, the Confucian court officials at first drafted a version of this epitaph that glossed over Zhu Yuanzhang's humble origin. But he would have nothing of it and revised the text. By now it tells the more accurate story of his early hardship, the long struggle against local warlords and against the remnants of the Mongolian regime that he had to defeat in order to establish the Ming Empire. An excellent translation line by line with complete annotations can be found here. The stele was erected in August 1378. For those interested it is a treasure trove into how one rises from total poverty to presiding over one of the largest countries of the Earth. Across the road from the Huangling Stele is the so-called "No-Word" stele. It was originally placed there for aesthetic and symmetric reasons. But it soon came to take on a whole new meaning. Even though the stele carries no inscription, it nevertheless speaks out a loud and clear message. 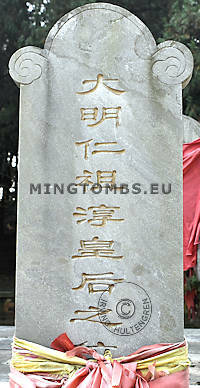 Being simple peasants Zhu Yuanzhang's parents did not achieve any major accomplishments in life, which would be worthy of inscribing on a stele. At the same time, the parents' simple life had allowed them to live out great human values and honorable morals that in turn would become beacons for Zhu Yuanzhang's own actions on his way to the throne. So, at the end of the day, the "No-Word" stele says it all without saying anything. Next up the Sacred Way is the Sacrificial Hall, or rather, this is where it was originally constructed. There is little to nothing left of it now, but this is the building in which Zhu Yuanzhang would have paid tribute to his parents once or twice a year. 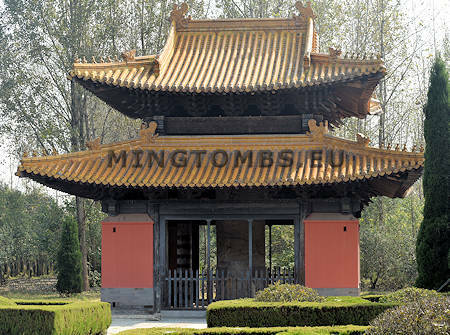 A placard in the mausoleum suggests that the Sacrificial Hall would have been among the largest constructed by the Ming. This would for instance then be same size as the Sacrificial Hall in the Ancestral Hall in central Beijing, shown here on this page. The space within Huangling mausoleum is actually large enough to have accommodated such huge structure, but it is doubtful that Zhu Yuanzhang would have erected such a big building as it would have dwarfed and have been out of proportion with the rest of the mausoleum contents. The image covers the space where the hall would have been. It would have stood from where the hedges are in the rear (where the shadows begin) and to where the camera was placed in the front. The current path would have cut the building in two down the center. Today only the water drainage canals and some elevated soil platforms show where the building would have been. Also, a few plinths can be found here and there. 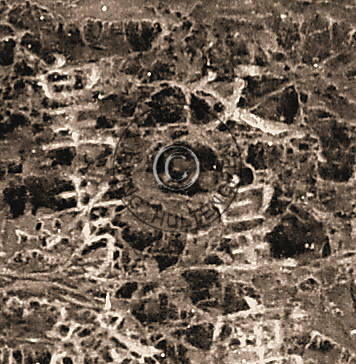 The plinths were the base on which the round columns were placed that again would support the roof structure. At the far end of the mausoleum lie the altar and the place where Zhu Yuanzhang's parents were interred. The elongated altar stands on a triple level platform. On top of the stone altar are the traditional five sacrificial stone vessels of two vases, two candle holders and one incense burner. They are all of a newer date. 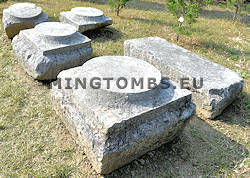 But different from other Ming mausolea are the two small stone steles added on the altar. One of them carries the name of Zhu Yuanzhang's father and the other that of his mother. 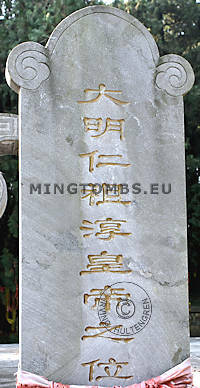 Huangling does not have a soul tower in which the steles inscribed with the name of the tomb occupants could be placed as otherwise became tradition commencing with the third Ming Emperor, the Yongle Emperor. 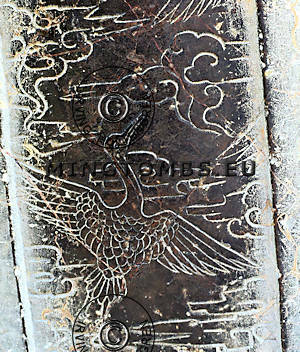 The top of the incense burner is engraved with a dragon motif snaking all around the burner. the other vessels and the altar rim are decorated with floral patterns. Behind the altar is the burial mound under which Zhu Yuanzhang could finally lay his parents to rest in a proper manner and in accordance with filial respect. The tumulus is some 4-5 meters high and is in an almost oval shape. It is covered with evergreen trees commonly used to add serenity but also to absorb rain water and thus reduce the risk of flooding of the burial chamber. A small paved path leads around the tomb mound. The back wall of the mausoleum is an ordinary red brick wall and does not match well with the spirit of Huangling. 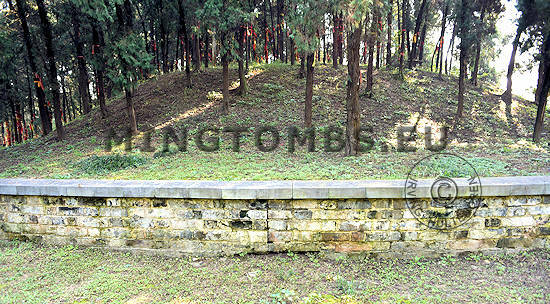 The wall surrounding and retaining the tomb mound is constructed with the oversized brick commonly used during the Ming dynasty era. 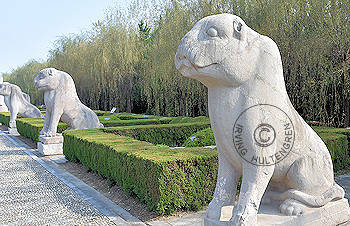 Local efforts to restore Huangling have been highly successful and the overall mausoleum appears serene and well kept. A slightly improved back wall (south) would demonstrate more respect for the tomb of the parents of the last Chinese Han dynasty.